I sat there watching Sam watching the squirrels, and it reminded me of myself when I was two, learning about the natural world from my grandfather. He was an animal lover, and a hunter, two facets of his personality I've never been able to reconcile. I know from firsthand exerience, though, that he went out into the woods to observe the animals a lot more often than he went there to shoot them. And it was from him that I learned how to sit quietly and observe. Two-year-old Sam was named after my grandfather Sam, and I see my grandfather in him more and more every day. Sam loves every kind of animal and already wants to know how they're different and how they're the same. First he was obsessed with pandas, then it was seals. Now it's rodents. For the last few weeks, he's been trying to understand the difference between mice, chipmunks, and squirrels. 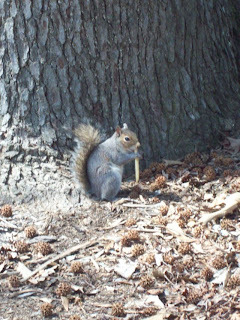 We've spent hours at my laptop, on Google images, clicking from pictures of chipmunks, to squirrels, to mice. Now that he's discovered the movie Lady and the Tramp, where a rat figures heavily into the ending, he's trying to understand where they fall in the phylum, too. The squirrels in the park are now Sam's "squirrel friends," and it makes me happy to think that Sam feels like he has a relationship with them. 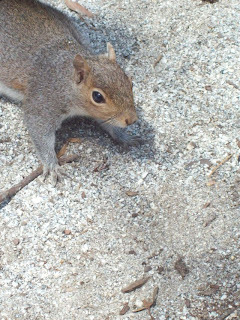 My grandfather never had any "squirrel friends." (Which is understandable. I wouldn't be friends with someone who thought I tasted delicious, either.) But Ira, his neighbor across the street, did. 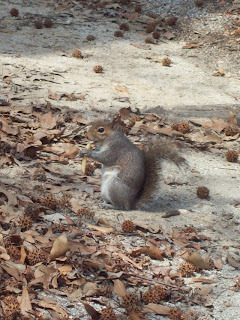 Ira had been feeding several generations of the same squirrel family for years, and he'd sit on his back porch and they'd swarm from all directions for the freshly cracked nuts he offered. Even at my very young age, I knew what I was witnessing was extraordinarily uncommon. Squirrel friends are few and far between in this world. we had squirrel friends in my backyard growing up, and one neighbor was friendly enough with one squirrel, to allow it in her kitchen where it would munch on sprouts she had growing on the windowsill. we also had woodchuck and eventually a famly of deer. the wood chuck and deer still inhabit my parents backyard. your memories of your grandfather remind me of mine of my father. we'd sit on the patio or be in the garden together, answering the birdcalls for what seems likes hours now, but more likely added up to hours in the long run. the key was the patience and love of nature he taught me.